The soy plant produces edible beans, which are the source of a wide variety of health benefits. Over the course of thousands of years, different products have been developed from soybeans, each of them with great nutritional and medicinal properties. Archeological and historical evidence points to China as the cradle of soy domestication. Influenced by the vegetarian teachings of Buddhism, the Han dynasty (202 BCE to 220 CE) invented tofu and other fermented soy products that now are essential to the Asian diet. However, soybeans did not begin spreading throughout the rest of the world until the 16th and 17th centuries; nowadays, soy is nutrient-rich global staple. 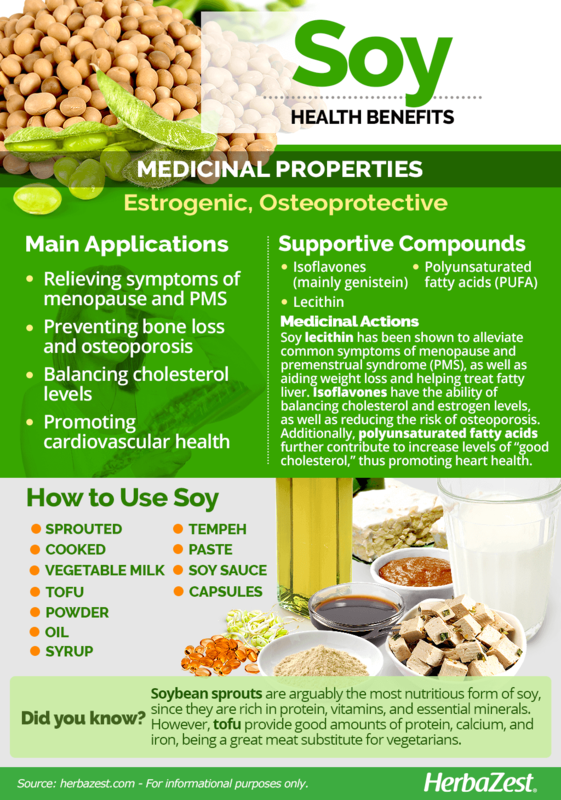 In addition to being a nutritious element of any meal, the most important soy health benefits are, arguably, its estrogenic and osteoprotective properties that have found a variety of medicinal uses. Relieving symptoms of menopause and PMS. This is due to its ability to mimic estrogen in the body, helping the body cope with fluctuating estrogen levels that characterize menopause and premenstrual syndrome (PMS). Preventing bone loss and osteoporosis. Soy helps to decrease the activation of osteoclasts, the cells that resorb bone. This results in reduced bone loss. Balancing cholesterol levels. It can help reduce LDL cholesterol levels, which are considered unhealthy when too high. Promoting cardiovascular health. Soy has been found to decrease triglyceride levels, a major factor in both heart disease and high cholesterol. Lecithin is probably the most well-known compound in soybeans. Soy lecithin is made of a complex mixture of phospholipids, and it has the ability of repairing damaged cell membranes. Lecithin has been shown to alleviate fatigue in middle-aged women, as well as other common symptoms of menopause. Additionally, soy lecithin has become a popular weight loss supplement, since it promotes fat metabolism and regulates the accumulation of lipids in the liver, thus helping prevent and treat both obesity and hepatic steatosis. Soy is also rich in isoflavones, which have been shown to promote cardiovascular health, slightly reducing the concentration of low-density lipoproteins in individuals who had very high levels of cholesterol. Soy isoflavones help restore hormonal balance when there's a deficiency by activating estrogen receptors, though not as strongly as human estrogen (endogenous estrogen). 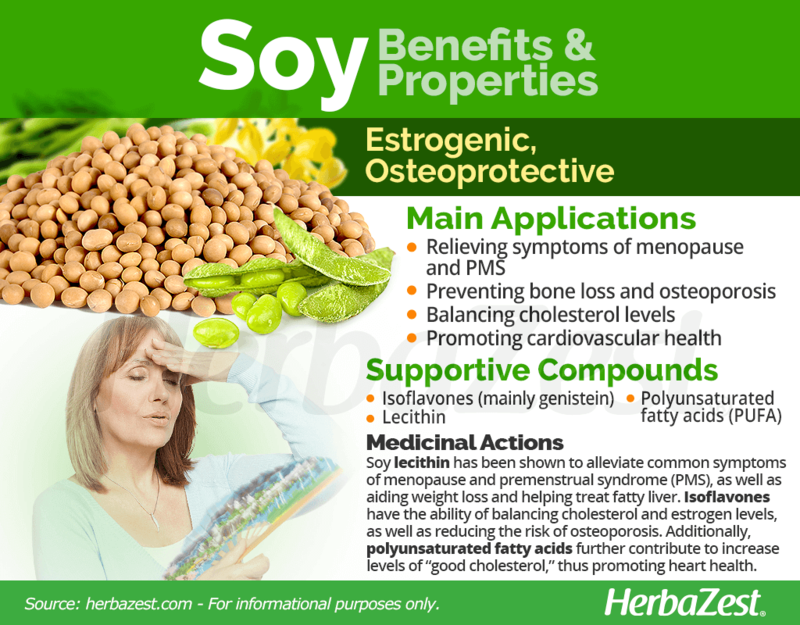 Studies have shown that isoflavones increase bone mineral density in postmenopausal women, suggesting that soy consumption may reduce the risk of osteoporosis. A particular isoflavone in soy, genistein, is a type of phytoestrogen that works in a similar way to human estrogen in the body. As a plant-based source of protein, soy also has several therapeutic uses. It can help reduce LDL cholesterol, the "bad" kind, while increasing HDL cholesterol, which is beneficial. This not only because soy can replace cholesterol-heavy meat sources of protein, but also likely due to its rich content of polyunsaturated fatty acids and isoflavones. Furthermore, preliminary studies indicate that one of soy's protein fractions, known as 7S, may have a role in inhibiting the development of atherosclerosis by acting directly within the arterial walls rather than on plasma lipids, or low-density lipoprotein cholesterol receptors. Herbs like chia, sacha inchi and sesame are great sources of healthy fatty acids, whereas estrogenic properties can be found in black cohosh, dong quai, and flax. Although it lacks estrogenic properties, maca contains active compounds that stimulate the endocrine system, regulating the production of hormones and relieving menopause symptoms. In culinary amounts, soy consumption is generally regarded as safe, even during pregnancy. However, long-term use of soy as a dietary supplement can cause stomach pain, bloating, constipation, diarrhea, and menstrual changes. Soy is a well-known food allergen. Sensitive people can experience allergic reactions after consuming soy or soy based products. Warning signs include skin rash, itching in the mouth, stuffy or runny nose, nausea and asthma symptoms. Women with hormone-sensitive cancers (breast, ovarian, or uterine cancer), or hormone-sensitive conditions, such as endometriosis, should moderate soy consumption (especially soy supplements) or avoid it altogether. Since soy possess anticoagulant properties, people with bleeding disorders, as well as those taking drugs that may increase the risk of bleeding should moderate its consumption. Additionally, people with diabetes or low blood sugar, and those taking drugs, herbs, or supplements that affect blood sugar should be aware that soy may lower blood sugar levels. Fresh soybeans need to be cooked with wet heat (steamed) in order to destroy the trypsin inhibitors they contain, which can be harmful to humans. CONTRARY TO POPULAR BELIEF, STUDIES HAVE SHOWN THAT SOY PRODUCTS HAVE NO ADVERSE EFFECTS ON MEN. Soybeans, like all legumes, are protein-rich and nourishing, but they also contain a large amount of polyunsaturated fats, leading to the plant's classification by the Food and Agricultural Organization as an oilseed rather than a pulse. The nutritional value of soybeans can be obtained in many ways, since a wide variety of soybean products have been created over the course of thousands of years. Although soybean sprouts (very popular and widely available around the world) are a complete source of vegetable protein, vitamins, and minerals, the fermentation process of tofu improves the concentration of calcium and iron, both essential for strong bones and red blood cells production. When it comes to healthy fatty acids and protein content, essential for building muscle (especially in vegetarian and vegan diets), as well as dietary fiber and most essential minerals, tempeh is by far the best option. Due to its particular process of fermentation, tempeh provides almost three times the amount of protein in soybean sprouts, and twice the amount in tofu. However, tempeh is not as popular or available as other soybean products. Fresh soybeans, popularly called "edamame", are a good source of protein, although not as much as other forms of soy. They provide the same concentration of healthy fatty acids as tempeh, as well as higher levels of dietary fiber compared to soybean sprouts and tofu. Tofu is the best soy product for calcium supplementation (14% DV per 100 g), whereas soybean sprouts are the second best option for vegetable protein (26% DV) after tempeh (46% DV). The best way to take advantage of all the nutritional content and health benefits of soybeans is consuming them in culinary forms. However, the main components in soybeans (basically lecithin, vegetable protein, and isoflavones) are isolated into different formulations that provide particular benefits. 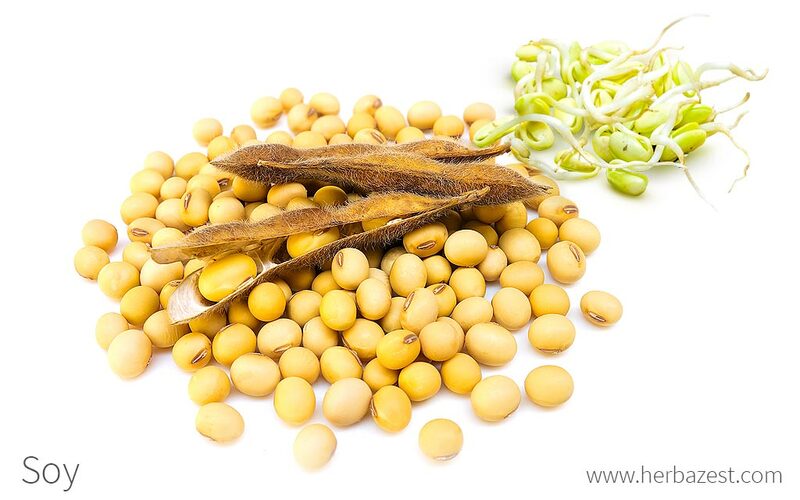 It is important to know that, while supplements can be beneficial to fully reap the specific soybean properties, in the case of specific health conditions a doctor must be consulted before start taking soy products for medicinal purposes. Due to their high amount of phytoestrogens, soybeans and their byproducts always should be taken in moderation. Sprouted. Soybean sprouts are arguably the most nutritious form of soy; with a nice, crispy consistency, they are rich in protein, vitamins, and essential minerals. Soybean sprouts can be added to salads and sandwiches, and are often used in Asian stir fry dishes. Cooked. Widely known as "edamame", unripe soybeans should be boiled or steamed before consumption. Frozen edamame takes four to five minutes to be ready, while fresh edamame will take up to six minutes. In this form, soybeans are higher in healthy fatty acids and protein, and lower in carbohydrate. Vegetable milk. This is a great way to get soy protein without the fiber. Soy milk can be home made by cooking dried soybeans, blending them with water and straining the mixture through a cheese cloth. However, there are many commercial brands that offer soy milk, plain or in a variety of flavors, often fortified with both calcium and vitamin D.
Tofu. Also known as soy curd, tofu is the result of curdling soy milk with a coagulant agent called nigiri. Widely popular and considered as a soft cheese-like food, tofu is usually packaged in water and should be refrigerated until used. Tofu is rich in plant-based protein, calcium, and iron, being a great meat substitute for vegetarians. Tempeh. This is a naturally fermented soy product, with a cake-like appearance and firm texture that includes the whole soybeans. Tempeh is often used as a meat substitute in a variety of recipes, since it provides outstanding levels of protein and healthy fatty acids. Paste. Made of fermented soybeans, along with other grains, marine salt and koji mushrooms, this thick paste is called miso, and it is used to flavor many Asian dishes. Miso is a good source of protein and it has been considered as a healing product for centuries. Sauce. A signature flavor in Asian cuisine, soy sauce is traditionally made by fermenting soybeans, wheat grains and sea salt. It has been shown to have digestive, antimicrobial, and antioxidant properties. However, due to its high sodium content, soy sauce must be consumed in moderation. Powder. This formulation brings a high concentration of soy protein. It is usually taken as a substitute of meat for people with dietary restrictions, and as a complementary source of protein to prevent and treat osteoporosis. Oil. Extracted from soybeans and popularly used for cooking, this oil is rich in polyunsaturated fats, which can help reduce bad cholesterol levels, as well as the risk of heart disease and stroke. Syrup. This estrogen enhancer can be made at home from soy sauce, and it can help relieve the premenstrual syndrome , as well as menopausal symptoms. Capsules. These capsules offer a high content of isoflavones. They are usually directed to women with estrogen deficiencies, so they can take advantage of the estrogenic properties of soy. Soy sprouts, as well as raw or green soybeans, popularly called edamame, can be found in most large grocery stores and supermarkets around the world. However, the most common way to purchase soybeans is in their cooked form, as tofu, soy milk, or powder. Soy supplements can be easily found in pharmacies and specialized health stores, as well as in the over-the-counter section of most supermarkets, but there is also a wide choice of supplements available for delivery in most places around the world through online retailers. Each brand of soy supplement may come with different concentrations, so it is important to read the labels, and take it as directed. People with specific health conditions should seek medical advice before consuming soy in therapeutic doses. The soy plant is a hardy, annual herb that can be cultivated in a wide variety of conditions around the world. However, it thrives under certain conditions of soil, temperature, and irrigation. Soy plants thrive in full sun and alkaline soils, with a pH of 6.0 - 6.8. Thanks to its ability to fix nitrogen into the soil, it works great when rotating crops or if a plot of land has lost some of its natural fertility. In light or sandy soils, a side-dressing of fertilizer may be needed after heavy rainfalls. Soybeans should be planted after all danger of frost has passed and the soil has warmed (late winter - spring). Poor germina­tion and rot are likely if the soil temperature is below 50°F (10°C). For continuous harvest throughout the summer, seeds should be planted every two or three weeks until mid-summer. In order to let soy grow to its best potential, it should be planted in the ground about one to two inches (2.5 - 5 cm) deep, with two to four inches (5 - 10 cm) left between each plant. Soybeans require 80 - 90 days to harvest. They will be ready when the seeds are fully enlarged, but before they become hardened. Rows of soy are usually grown 24 - 30 inches (61 - 76 cm) apart. It is important to ensure that soy plants are well moisturized and weeded, watered, and fertilized appropriately. Soy is an herbaceous annual plant that can grow up to 6 feet (2 m) tall. It possesses trifoliate leaves that usually fall before the seeds are mature, and it also has white, pink, or purple flowers. As the plant matures, each pod produced will contain two to four soy beans each; these beans constitute the most economically and nutritionally valuable part of the soy plant. Soy, or Glycine max, is a member of the Fabaceae family, also known as the Leguminosae family, which includes approximately 19,400 species, making it the third largest land plant family. Economically important and medicinal members of this family are acacia (Acacia spp. ), alfalfa (Medicago sativa), astragalus (Astragalus membranaceus), fenugreek (Trigonella foenum-graecum), licorice (Glycyrrhiza glabra), mesquite (Prosopis pallida), and senna (Cassia senna). Since Glycine max has been a domesticated crop for many centuries, the wild soybean (Glycine soja) is regarded as a distinct species from modern, edible soy. 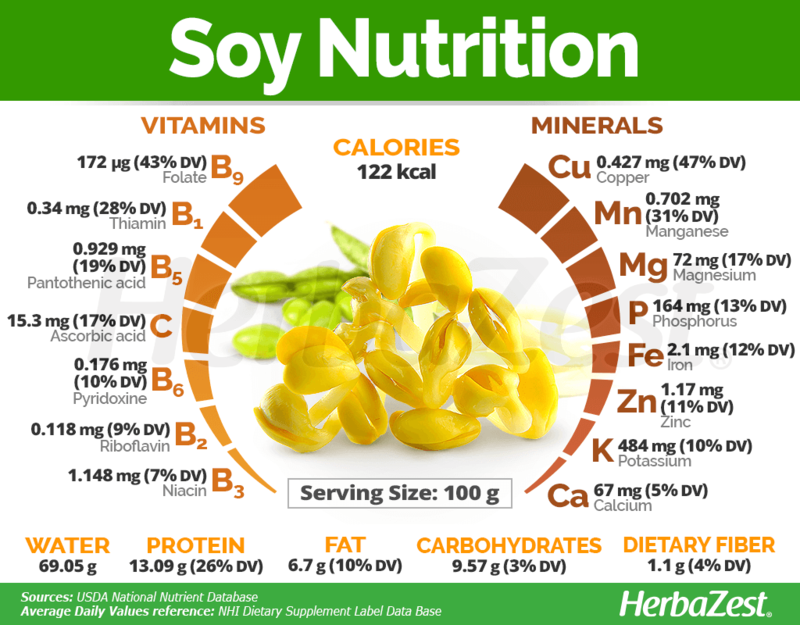 However, many varieties and cultivars of soy have been developed through selective breeding around the world, and although each may receive different names in specific regions, they can mostly be grouped in yellow, green, black, and white soybeans. In 1996, genetically modified (GMO or transgenic) soybeans were also grown for the first time, and they make up for most of the world's yearly soy production today. Genetically modified soy remains a controversial issue because of alleged - but unproven - health and environmental concerns. However, many varieties of GMO soy are more protein-dense and have allowed for improved yields and more resistant crops at cheaper prices, contributing to the effort to eradicate world hunger, especially in areas of famine. The evidence suggests that the soy plant is native to the eastern half of north China, where it was first domesticated around the 11th century BCE. 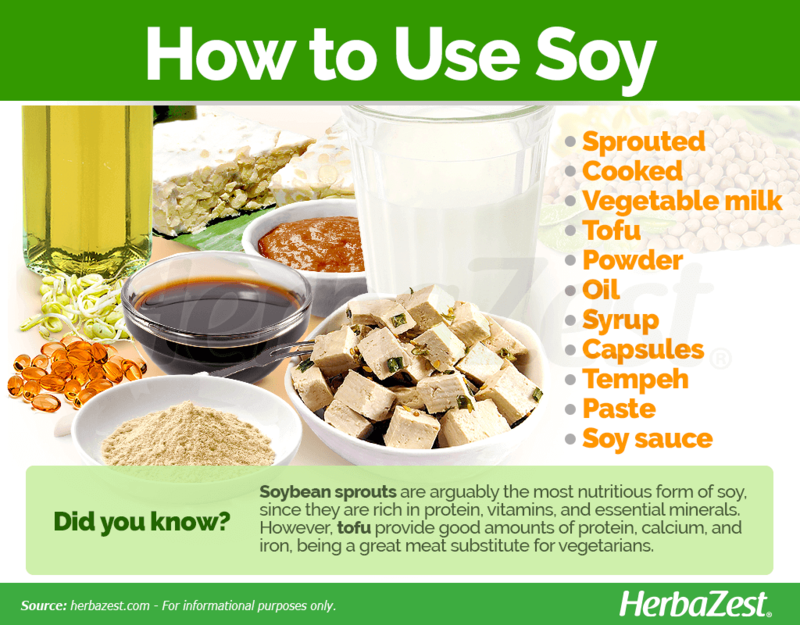 The dissemination of soy throughout Asia took place from about the 1st century CE to the 16th century. During this extended period of time, and thanks to well-established trade routes, such as the silk road, soybeans were introduced in many countries, mainly Japan, Indonesia, the Philippines, Vietnam, Thailand, Malaysia, Burma, Nepal, and the north of India, quickly becoming a food staple, as well as a common reference for Asian culture. Soy was brought to the West by European travelers. By the 17th century soy sauce was a popular commodity and, in 1679, John Locke wrote in his diary that mango and soy were brought to England from the East Indies. The soy plant arrived to North America in 1765, when Samuel Bowen, who received seeds from China, introduced it in Georgia under the name of "Chinese vetch". It wasn't until 1804 when Dr. James Mease first referred to the Asian bean as "soybean", since it was used to produce soy sauce. Chinese records state that soybean domestication can be dated back to the 11th century BCE. Because of its versatility, soy is of high economic importance throughout the world. It is used to produce soy oil, soy meal for human and livestock consumption, bio fuel, and herbal supplements. The United States is the largest producer of the soybean, with roughly 75 million metric tons of soybeans produced in that country alone each year. Alimentary Industry. Soy proteins are used in infant formulas and enteral nutrition products, as ingredients in meat products, and as protein supplements. Soy fiber is used in enteral nutrition products and some bakery goods. Packaging. Soy is used when packaging many food products in order to preserve their shelf life. Feed. Soy is a popular ingredient for cattle feed. Fuel. Soy is now being used in the creation of biodiesel fuels as an alternative to gasoline. Household products. Soy can also be found in lubricants and cleaning products. The fiber of the soy plant is also used in the manufacturing of plywood, carpeting, and upholstery.